In Cleopatra’s day, olive oil was immensely expensive; a luxury for the rich who used it to beautify themselves. Now that olive groves have spread around the world, we can all benefit from Cleopatra’s beauty secrets. 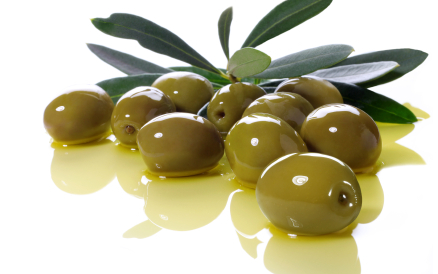 Olive oil has a similar chemical structure to the oil we secrete through our pores. It is easily absorbed and its anti-aging polyphenols scavenge free radicals to reduce oxidative stress and inflammation. That means your skin shows less wear and tear and develops fewer wrinkles. The polyphenols in olive oil support the elasticity of blood vessels. That means they can slow down the aging of your skin. Olive oil will help your skin stay plumped up and firm. It slows the evaporation of water, plus it increases the skin’s water-holding capacity. Your skin will be smoother, too. Olive oil’s emollients will fill and lubricate the small cracks that form naturally between cells – your skin will have a silky-smooth texture. Research has shown that olive oil can protect the skin against sun damage when it is applied topically. It is also good for the skin when we eat it. Scientists think the amount of olive oil in the Mediterranean diet may be what keeps skin cancer rates so low in the region, despite the intense sunlight. The olive oil we use at Gaelle Organic contains 5 times more polyphenols than lesser grades of olive oil. It is made the traditional way by pressing olives between stones until the oil comes out – no tricky chemistry, no super-heating – just a long, slow squeeze. That is how extra virgin olive oil is made. We use only organic extra virgin olive oil. It is vastly superior. Polyphenols work best when there are a lot of different kinds available at the same time – just as they occur in nature. That is why natural moisturizers made from whole plant oils are so effective. They are not compromised by chemical processing. All their beauty benefits remain intact. Our mission at Gaelle Organic is to use the finest wild-crafted and organic ingredients prepared with the minimum of processing so that you can enjoy the full beauty benefits that Nature has to offer. 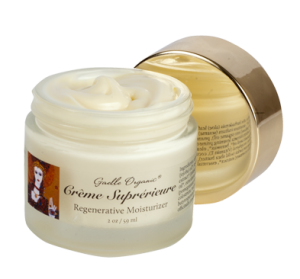 You can take advantage of the beauty benefits of olive oil by using our Creme Superieure, our Reborn Exfoliant or our Soap Supreme. 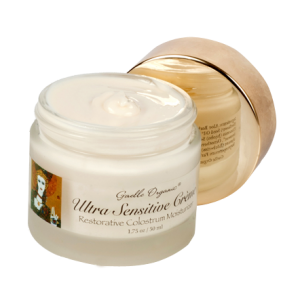 They have each been formulated to restore luster and beauty to dry skin.